Last weekend we went as a family to a local Oktoberfest celebration. Because we are the type of parents who take their children to a beer festival in the fall instead of a corn maze or pumpkin patch. I mean, seriously. Even my son wondered aloud about our judgment in taking children to a place where they celebrate booze. No matter. It turned out okay; in addition to the beer festivities, there were food vendors and crafters and a few rides and midway games and dachshund races and polka music and even a giant Twister competition. Which quickly turned pornographic as one contestant failed to understand that Twister is best played when you are not wearing a dirndl mini with nothing but a thong underneath. It was a gorgeous day and we had taken some friends along also, so we all had a great time strolling around, sampling the various food and drink offerings, and taking in all the sights. We even let the kids play a couple of carnival games, because as everyone knows, no one wins at those things and what’s the harm, really? 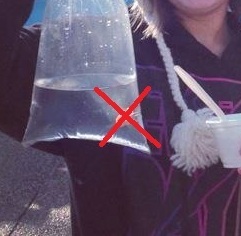 A fish in a bag has got to be the worst prize ever. Never mind the unadulterated joy on their faces. If you know me just a little bit, you know that I am against keeping pets. There is something unnatural to me about keeping an animal in your house simply for your enjoyment. It seems wrong to separate them from their own kind, even though most pets in the world are bred for our enjoyment only. Whatever. I’m weird. Plus pets are dirty and can’t clean up after themselves, and I am wholly against any creature which can’t ever learn how to clean up after itself. It was a weak moment. I allowed my children to play this game in which the prize was a goldfish, and they proved to be so adept at this game that each of them won. I probably need to learn to underestimate my children less. So we brought the goldfish home, set them up in a bowl that I had miraculously saved from a previous fish-keeping debacle, and watched them swim around in the way that fish do, in circles and with their watery eyes staring out each side of their strange, torpedo-shaped bodies, their silvery-orange scales glistening fragilely and creeping me out every time I walked by. Everyone I know has a story about carnival fish: they rarely last the first night, they live for years, they are all diseased and one of ours may be pregnant. It's just a matter of time, right? RIGHT? I'm a terrible parent. Don’t tell my kids. Update: A mere 24 hours after this story posted, the second fish succumbed to carnival fish-itis, and we are blessedly back to pet-free living. Exhale. Your nephews, Cody and Jasper, just want you to know they are happy and healthy staying in the house as pets. I'm sticking my tongue out at you. Inside they're crying. Oh, no. 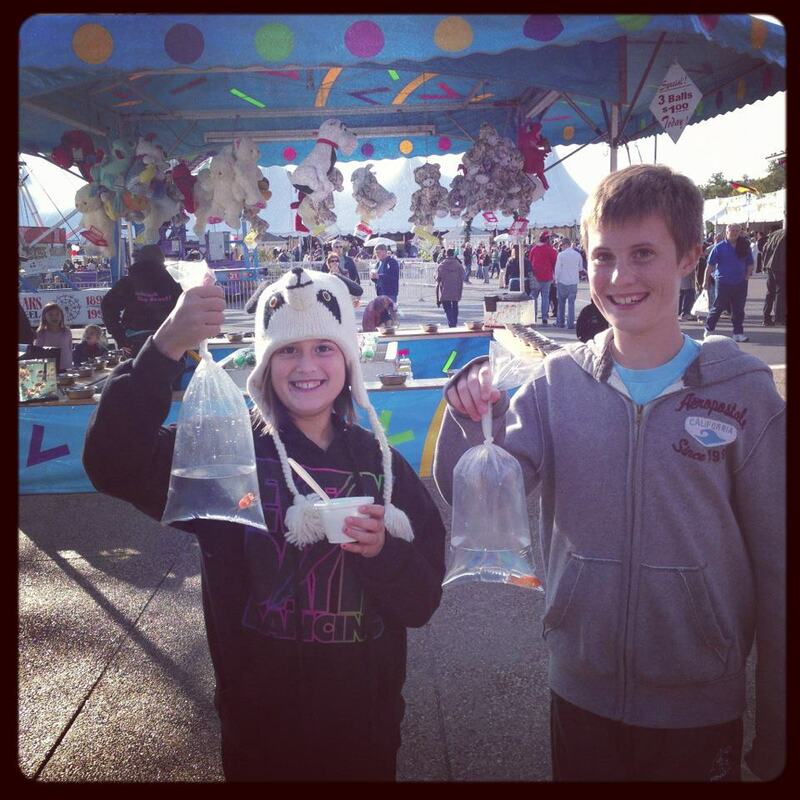 The community fair goldfish curse. Had a few of those "tank" on me in my childhood. (Sorry, bad pun.) You'd think I would stop, but noooo....had to prove that the next one would be the one to survive. 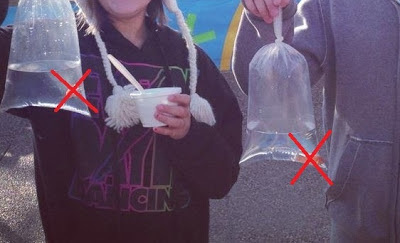 My role as a parent may be to teach my children that the depair over losing a fish is far greater than any joy that keeping a fish could ever bring them.